Behind Ashley Blankenship and Caitlyn Puckett’s efforts, Minford handed Oak Hill a 61-48 loss in SOC II action Thursday evening. 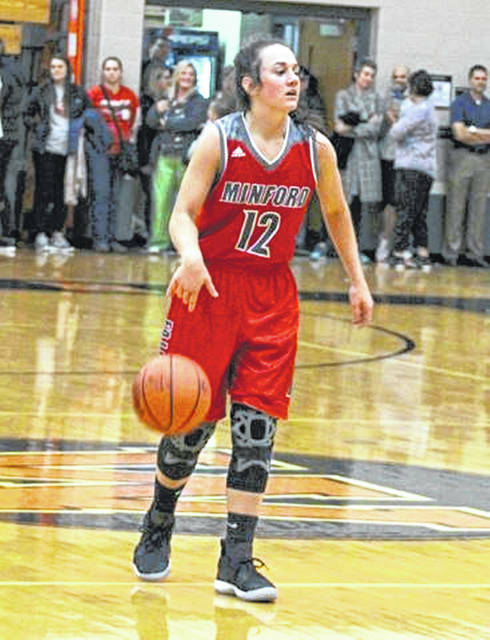 MINFORD — For someone who doesn’t “usually shoot” the 3-ball, Caitlyn Puckett sure was dialed in Thursday night. Using the deep ball, the junior forward scored early and often, spearheading Minford to an early lead over Oak Hill in Southern Ohio Conference II action. Puckett finished with 15 points — four 3-point field goals — and added eight rebounds and three assists … you know, for good measure. “I usually don’t shoot [the 3] but it was open so I was like, ‘Oh, it’s open,’” Puckett said. Take what you can get, right? As a whole, that’s exactly what Minford did in a 61-48 win over Oak Hill; the team’s second conference win in as many nights after a season-opening loss to Wheelersburg. In Wednesday night’s win over Portsmouth West, the Falcons (2-1, 2-1 SOC II) called upon guards Livi Shonkwiler and Maddie Slusher to do their dirty work. Thursday, those two passed the torch to Puckett and 6-foot-2 center Ashley Blankenship. Blankenship was a force down low all evening long, scoring a team-high 16 points and bringing down 12 rebounds. But possibly the best part of her performance was knowing when to pass. That game plan served as a recipe that concocted a win and Davis’ team followed it to a tee. Overall, Minford was 8-of-15 from beyond the 3-point arc — that was a product of relocating — and outrebounded the Oaks (3-1, 2-1 SOC II) by a 33-18 margin. Blankenship isn’t at all wrong. Even with the loss to ‘Burg, the Falcons’ win over Oak Hill forces a five-way tie atop the conference standings and, although it’s still early, Minford looks to be clicking on all cylinders. Within the first three minutes of the contest, Minford’s Hannah Tolle scored twice, off two assists from Puckett, to give the Falcons a 4-1 lead. It was a lead they’d never surrender. By the end of the first quarter, Tolle had six points and Minford had a 16-8 edge. At the 3:31 mark in the second, Tolle had nine and Puckett had eight while the Falcons held a 26-14 lead before taking a 30-19 advantage into halftime. The third quarter certainly wasn’t kind to Oak Hill. The Falcons outscored the Oaks 17-7 to blow the doors wide open and enjoy a 47-26 lead heading to the fourth and final eight minutes. Following Puckett and Blankenship’s efforts, Tolle added nine points and six rebounds while Shonkwiler finished with nine points, four boards and three assists. For Oak Hill, Caitlyn Brisker scored a game-high 20 points alongside four rebounds. Kasey Riley also helped out with 10 points while Brooke Howards ended the night with six. The Falcons get back to action Saturday afternoon against East Carter at Boyd County. Tip-off is scheduled for 1 p.m.
Oak Hill: 15-41 FG, 16-28 FT, 2-13 3pt. (Crabtree 2), 18 rebounds (Brisker 4, Riley 4), 20 turnovers, 4 assists (Brisker 2). Scoring: Brisker 20, Riley 10, Crabtree 8, Howard 6, Chambers 3, Clarkson 1. Minford: 20-46 FG, 13-17 FT, 8-15 3pt. (Puckett 4), 33 rebounds (Blankenship 12), 20 turnovers, 13 assists (Puckett 3, Shonkwiler 3). Scoring: Blankenship 16, Puckett 15, Shonkwiler 9, Tolle 9, Slusher 7, Watters 5.
https://www.portsmouth-dailytimes.com/wp-content/uploads/sites/28/2018/12/web1_puckett_120618-2.jpgBehind Ashley Blankenship and Caitlyn Puckett’s efforts, Minford handed Oak Hill a 61-48 loss in SOC II action Thursday evening.